The year 2018 is a milestone one in the history of the Ukrainian Orthodox Church in Diaspora, Diocese of Australia and New Zealand (Ecumenical Patriarchate of Constantinople). It is during this year that our church celebrates the 70th anniversary of the first Ukrainian liturgy to be held on the Australian continent. The Council of Bishops and Consistory of the UAOC in Australia and New Zealand, held a number of events and celebrations to commemorate this remarkable achievement in our Church’s history. His Eminence, Archbishop Daniel of the USA, accompanied to Australia by Very Rev. Fr. Taras Naumenko, officiated at all the events. With great respect and love, the faithful of our church greeted Archbishop Daniel who, despite his duties as exarch to the Ecumenical Patriarchate in Ukraine, was able to attend and share these majestic celebrations with us. Our diocese was also blessed to welcome the Very Rev. Fr. Bohdan and panimatka Anna Matwijczuk of the UAOC in Great Britain, as well as clergy and faithful from Adelaide, Brisbane, Sydney, Melbourne, Geelong and Canberra. The commemorations began on Thursday 27 September, with a Liturgy at the parish of St. Nicholas in Canberra, for the Exaltation of the Holy and Life-Creating Cross of the Lord. After the Liturgy and lunch, meetings of the Consistory and Eparchial Council were held at the Ukrainian Orthodox Centre. That evening, the Embassy of Ukraine in Australia hosted the celebration of the 27th anniversary of Ukraine's Independence at the Commonwealth Club. At this event, Archbishop Daniel had the opportunity to meet with the wider Ukrainian community in Australia, ambassadors of other countries and representatives of the Australian government, to co-celebrate the Independence Day of Ukraine. On Friday 28 September, Archbishop Daniel held meetings with the UAOC parish priests, chairpersons of Parish Councils and representatives from parishes of our Eparchy. A surprise birthday dinner in His Eminence’s honour, was held in a traditional Australian restaurant in Canberra. 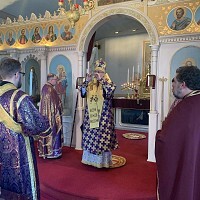 On Saturday 29 September, a commemorative Divine Liturgy was served at St. John the Baptist Anglican Church (45 Constitution Avenue), where the first Ukrainian Orthodox liturgy was servedby Fr. Ananij Teodorowychseventy years ago. On 26 September 1948, that Divine Liturgy initiated not only the parish of St. Nicholas in Canberra, but also the birth of the Eparchy of the Ukrainian Autocephalic Orthodox Church in Australia and New Zealand. The commemorative liturgy was led by Archbishop Daniel in co-celebration with our UAOC clergy. The liturgy was attended by the Ambassador of Ukraine in Australia, Dr. Mykola Kulinich and his wife Olena; Ruling Bishop of the Ukrainian Greek Catholic Church, His Grace Bishop Peter Stasiuk, Fr. Volodymyr Kalinecki and Fr. 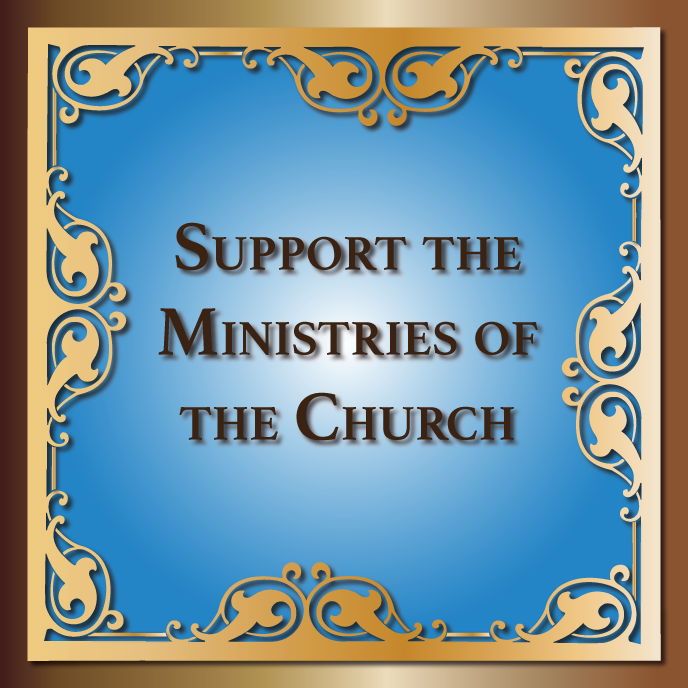 Lawrence Foote; The Reverend Canon of the Anglican Church of St. John the Baptist, Fr. Paul Black; Chairman of AFUO, Mr. Stefan Romaniw OAM; Representative of the Greek Orthodox Eparchy and Archbishop Stylianos, Very Rev. Fr. Petros Kipouris, as well as members of the wider Ukrainian community. 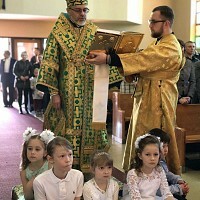 The commemorative liturgy was accompanied by the choir "Irmos" of the Ukrainian Orthodox Parish of St. Andrew the First-Called from Adelaide, as well as choristers from Sydney and Canberra. The combined choir was conducted by archpriest Fr. Evhen and panimatka Iryna Kvasniuk. Following the Liturgy, a Memorial Service was held at the ANZAC Memorial (cnr. ANZAC Parade & Constitution Avenue Canberra). Our first ANZACS from Ukraine and all those of Ukrainian heritage who served in the Australian Defence Forces in conflicts during the past century, were honoured. The Memorial Service was led by Archbishop Daniel and Bishop Peter Stasiuk. Acatafalque party from The Australian Armed Forces was involved in this remarkable commemoration. After the laying of wreaths at the ANZAC memorial, solemn words were expressed by His Eminence Archbishop Daniel, His Excellency Dr. Mykola Kulinich and Mr. Stefan Romaniw OAM. The Saturday commemorations ended with a buffetlunch at the Ukrainian Orthodox Centre, during which speeches were delivered by Archbishop Daniel, Bishop Peter Stasiuk, Fr. Michael Solomko and Dr. Mykola Kulinich. Chair of the AFUO, Mr Stefan Romaniw, presented a plaque in commemoration of the 70th anniversary of the UAOC in Australia to the Chair of the UAOC Consistory, Fr. Michael Solomko. Those who attended the lunch at the parish hall were entertained by the children of the ‘LesyaUkrainka’ Ukrainian School at the Parish of St. Nicholas,who enthusiastically performed 2 Ukrainian songs. Fr. Evhen Kvasniuk played guitar and sang spiritual songs which he wrote himself. On Sunday 30 September, the Hierarchical Divine Liturgy wasled by Archbishop Daniel; with the participation of the UAOC clergy present and a large number of faithful and guests. After the Hierarchical Divine Liturgy, a solemn 85th anniversary Memorial Service was held to remember the victims of the 1932-1933 Holodomor in Ukraine. The Memorial Service remembering this great tragedy of our Ukrainian people took place near the memorial monument erected on the grounds of the Ukrainian Orthodox Centre in Canberra. Solemn words were expressed by Archbishop Daniel, Bishop Peter Stasiuk and Dr. MykolaKulinich; after which wreaths were placed at the Holodomor Memorial from various community organisations and individual parishes. A banquet in the St. Nicholas Parish Hall completed the jubilee celebrations of the 70th anniversary of the Ukrainian Autocephalic Orthodox Church, Diocese of Australia and New Zealand. The children of the ‘Lesya Ukrainka’ Ukrainian School greeted His Eminence Archbishop Daniel with the traditional bread and salt, and were delighted when His Eminence joined them in singing “Ukraina”. Blessed Certificates were presented to a large number of worthy recipients. All events associated with the 70th anniversary celebrations were extremely well planned and organised. Sincere thanks go to the Parish of St. Nicholas in Canberra, and especially to Fr. Michael Solomko (Consistory and Canberra), panimatka Kateryna Solomko (Canberra), Volodymyr Woytowych (Consistory and Strathfield West), Master of Ceremonies – Markiyan Melnychenko (Balaclava) and all other members of the 70thanniversary sub-committee; Joseph Wentzel (Perth), Anatol Zukiwsky (Brisbane), George Sobol (Adelaide), Nadia Namuren (Granville) and Fr. Michael Smolynec (Consistory and Strathfield West) for their great efforts and diligent work. 2018 рік – визначна віха в історії Української Автокефальної Православної Церкви (УАПЦ) в ДіяспоріЄпархії АвстралійськоНовоЗеляндській (Константинопольський Вселенський Патріярхат). Саме цього року наша церква відзначає 70-літній ювілей служіння першої Української Літургії на Австралійському континенті. На святкування прибув Його Високопреосвященство Владика Даниїл з Америки у супроводі священика о. Тараса Науменка. Вірні нашої церкви з повагою та любов`ю вітали Владику Даниїла, який не зважаючи на свої обов`язки екзарха Вселенського Патріархату в Україні, зміг прибути та розділити разом з нами це величне святкування. На відзначення 70-літнього ювілею в Канберру приїхав також о. Богдан і пані добродійка Анна Матвійчуки з Великобританії, рівно ж духовенство та вірні з Аделаїди, Брізбену, Сіднею, Мельборну, Джілонгу і Канберри. Святкування розпочалися з четверга, 27 вересня – свята Воздвиження Чесного і Животворчого Хреста Господнього. У Свято-Миколаївському храмі УАПЦ в Канберрі з участю Владики була звершена Літургія з прославленням Животворчого Хреста Господнього. Після Літургії відбулися засідання Консисторії та Єпархіяльної ради. Цього ж дня Посольством України в Австралії було організовано відзначення 27 річниці Незалежності України у Commonwealth Club, на якому Владика Даниїл мав нагоду познайомитись та поспілкуватися з ширшими колами нашого українського суспільства в Австралії, послами інших країн, представниками Австралійського уряду і разом відзначити День Незалежності України. В п`ятницю, 28 вересня відбулися зустрічі-розмови Архиєпископа Даниїла з священиками, головами Парафіяльних рад та представниками парафій нашої Єпархії.Несподіваний вечеря на день народження на честь Його Преосвященства відбувся в традиційному австралійському ресторані в Канберрі. В суботу 29 вересня була звершена Пропам`ятна Служба Божа в Англіканській церкві Св. Іоана Хрестителя (45 Constitution Avenue), бо саме в цьому храмі, сімдесят років тому, 26 вересня 1948 року о. Ананій Теодорович відправив першу українську Православну Літургію, яка започаткувала не лише Парафію Св. Миколая в Канберрі, але й зародження Єпархії Української Автокефальної Православної Церкви в Австралії та Новій Зеляндії. Літургію очолив Владика Даниїл в співслужінні православного духовенства. На Літургії були присутні посол України в Австралії др. М. Кулініч з дружиною п. Оленою, Владика Петро Стасюк, правлячий єпископ Української Греко-Католицької церкви з священиками о. Володимиром Калинецьким та о. Лаврентієм Футом, настоятель Англіканської церкви Св. Іоана Хрестителя о. Поул Блек, Голова СУОА п. Стефан Романів ОАМ, о. Петрос, який репрезентував Грецьку Православну Єпархію і Архиєпископа Стиліаноса та численна українська спільнота. Святкове Богослуження супроводжував хор «Ірмос» Української Православної Парафії Св. Андрія Первозванного з Аделаїди до якого долучилися інші хористи Єпархії. Співали під диригуванням протоієрея о. Євгена Кваснюка. Після Літургії служилася Меморіяльна Літія біля Меморіялу Нової Зеляндії (сnr. Anzac Parade and Constitution Avenue), вшановуючи наших 1-ших вояків ANZACS з України та всіх воїнів українського походження, які в складі Австралійських Збройних сил брали участь у військових конфліктах минулого століття. Літію очолили Владика Даниїл і Владика Петро Стасюк. На цьому пропам`ятному відзначенні були задіяні військові Австралійських Збройних сил, які урочистистю провели військову церемонію. Після покладання вінків до пам`ятника-меморіялу слово мали: Владика Даниїл, др. Микола Кулінич, голова СУОА п. Стефан Романів. Суботнє святкування закінчилося святковим обідом в Українському Православному Центрі, під час якого були виголошені промови Владикою Даниїлом, Владикою Петром Стасюком, о. Михайлом Соломком, др. Миколою Кулінечем та п. Стефаном Романівим, який вручив пропам`ятну грамоту 70-ліття УАПЦ в Австралії. В прицерковній залі всі присутні насолоджувалися концертом, на якому чудово виступали діти Української школи імені ‘Лесі УкраїнкиЖ при Парафії Св. Миколая і о. Євген Кваснюк, який у супроводі гітари співав свої власні духовні пісні. У неділю, 30-го вересня, служилася Архиєрейська Божественна Літургія, яку очолив Архиєпископ Даниїл, за участю всього присутнього Православного духовенства та великої кількості вірних УАПЦ та гостей. Після Літургії Заупокійною Літією вшановано пам`ять жертв з нагоди 85-тої річниці Голодомору 1932-1933 років в Україні. Літія в пам`ять цієї великої трагедії нашого українського народу відбулася біля пам`ятника-меморіялу, спорудженого на території Українського Православного Центру в Канберрі. Слово виголосили: Владика Даниїл, Владика Петро Стасюк і др. Микола Кулінич після чого були покладені вінки до пам`ятника Голодомору від різних громадських організацій та окремих парафій. Святковий бенкет в Українському Православному Центрі завершив ювілейне відзначення 70-ліття Української Православної Єпархії в Австралії та Новій Зеляндії.Діти української школиімені ЖЛесі Українки’ привітали Його Високопреосвященні Архієпископа Даниїла із традиційним хлібом та сіллю та були в захоплені, коли Його Високопреосвященство приєднався до них у співанні "Україна". Благослвенні Грамоти були представлені великій кількості гідних одержувачів. Всі події, пов'язані з святкуванням 70-річчя, були надзвичайно добре спланованими та організованими. Щиро дякуємо парафії Святого Миколая в Канберрі, і особливо о. Михайлу Соломко (Консисторія і Канберра), паніматка Катерина Соломко (Канберра), Володимир Войтович (Консисторія та Страффілд Вест), майстер церемоній - Маркіян Мельниченко (Балаклава) та всі інші члени 70-річного підкомітету; Джозеф Венцель (Перт), Анатолій Жуківський (Брізбен), Джордж Собол (Аделаїда), Надія Намурен (Ґранвіл) та о. Михайло Смолінець (Консисторія і Стратфілд Вест) за їхні великі зусилля та ретельну роботу.